Virtual Piggy is free to use. Parents sign up for an account, and then create profiles for each child they'd like to use the service. This requires entering the child's name and date of birth, and then creating a username and password for that child. The parent can set certain parameters for the child's online shopping, such as transaction limits (both in dollar amounts for individual transactions and per day or week), and approval settings (which means the service will notify you whenever your child makes a transaction that is either above a certain amount or with a certain merchant). You also link a payment method—a credit card or a PayPal account—to your child's profile and set a monthly allowance, which is the maximum amount the child can spend each month. 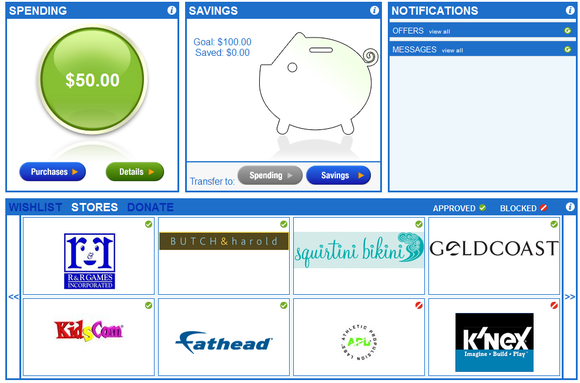 Virtual Piggy's child dashboard shows the user how much they have left to spend, and which merchants they're allowed to shop at. When they agree to work with Virtual Piggy, the retail sites decide which age children they'll work with. Using this information, Virtual Piggy creates a list of retailers that are age-appropriate for your child when you sign them up. You can delete sites from the child's account, but you cannot add others. Virtual Piggy says that it respects the retailers' limits on child ages. When your child logs in to their Virtual Piggy account, their dashboard shows them, in a large, colorful graphic, how much money they have left to spend. It also shows them their virtual savings account, which is defined by a goal you set up when creating their account. The child can transfer some of their spending money into this savings bucket, but the result is entirely virtual. They're not actually taking money from your credit card or linked payment account and putting it in a savings account, they're simply showing you how much they'd save. It's slightly confusing, even for adults. The Virtual Piggy payment button, shown here as it appears on Knex.com, allows children to make purchases without entering any personal data. I expected the shopping aspect to be a bit less confusing, but was stymied a bit here, too. I created a Virtual Piggy account for a 7-year-old boy, and linked a PayPal account as a funding source. When I logged in to his dashboard, I saw the list of available stores, but all were marked as "blocked." I used the option to send an approval request to the parent, but got a system error that surely would have perplexed a child. It wasn't until the next day that I was able to send the approval request properly—something the company attributes to a minor bug. Once the approval requests came through (they arrive via email and in your Virtual Piggy account, as all of the service's notifications do), I was able to figure out that the merchants were not approved because none of them accepted PayPal, and that was the only funding source I'd added. Once I linked a credit card to my account, the stores were approved for the child to shop at. Shopping takes you out of the Virtual Piggy site, but the child is not left defenseless. All of the merchants are supposed to have buttons on their site that allow the child to pay with Virtual Piggy, much the way you could select pay with PayPal as an option at some retailers. The child only has to enter their Virtual Piggy user name and password, and the transaction details are handled between the retailer and Virtual Piggy. If the transaction meets all of your approved settings, it goes through automatically, shipping to the address you've designated. If it needs approval, a notification is sent allowing the parent to approve or decline the purchase. In theory, this process sounds great. But it didn't always work quite as seamlessly for me. When I attempted to make a purchase from Knex.com, it worked well. The site had an easily identifiable Pay with Virtual Piggy button, and the service notified me of the transaction. But when my child tried to shop at Fathead.com, the site didn't have a Virtual Piggy button to be found, something the folks at Virtual Piggy say might be due to an update in process at that retailer. Overall, Virtual Piggy is a great idea in need of some fine-tuning. It could benefit from adding more retailers, something the company says is continually happening. And the folks at Virtual Piggy say they are working on overhauling the service from a usability point of view for children, something that will go a long way toward making Virtual Piggy the service it deserves to be. Virtual Piggy, a safe online payment system for kids, is a great idea in need of some fine-tuning.